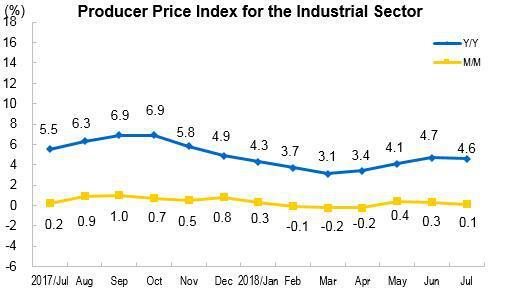 In July 2018, Producer Price Index (PPI) for manufactured goods increased 4.6 percent year-on-year, and increased 0.1 percent month-on-month. The purchasing price index for manufactured goods increased 5.2 percent year-on-year, and increased 0.1 percent month-on-month. 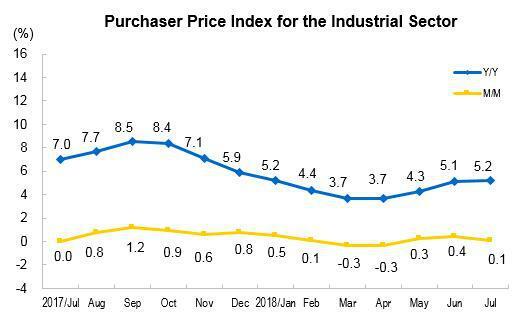 On average from January to July, the PPI increased 4.0 percent from the same period of the previous year, and the purchasing price index for manufactured goods went up by 4.5 percent. The year-on-year change of producer prices for means of production increased 6.0 percent, meaning 4.50 percentage points increase in the overall price level. Of which, producer prices for mining and quarrying industry increased 13.4 percent; that of raw materials industry increased 9.0 percent; that of manufacturing and processing industry increased 4.1 percent. Producer prices for consumer goods increased 0.6 percent year-on-year, meaning 0.12 percentage points increase in the overall price level. Of which, producer prices for foodstuff and clothing increased 0.7 percent, that of commodities went up by 1.1 percent, and that of durable consumer goods went down by 0.2 percent. The year-on-year purchaser price indices for building materials and non-metallic went up by 10.8 percent, fuel and power increased 9.9 percent, ferrous metal materials increased 7.7 percent, non-ferrous metal materials and wires went up by 5.6 percent, agricultural and sideline products decreased 0.7 percent. 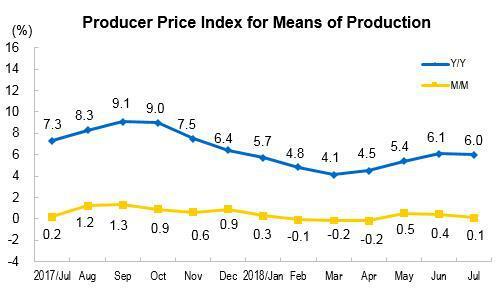 The producer prices for means of production increased 0.1 percent month-on-month, meaning 0.05 percentage points increase in the overall price level. Of the total, producer prices for mining and quarrying industry increased 0.6 percent, that of raw materials industry decreased 0.1 percent, that of manufacturing and processing industry increased 0.1 percent,. 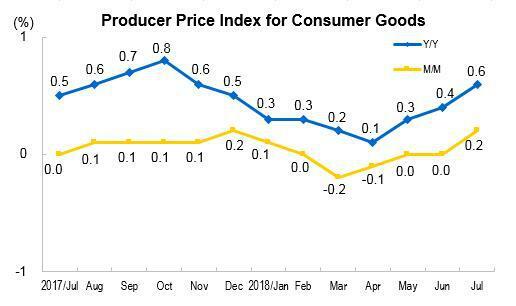 Producer prices for consumer goods increased 0.2 percent month-on-month, meaning 0.04 percentage points increase in the overall price level. Of the total. Of which, producer prices for foodstuff and durable consumer goods increased 0.2 percent, that of clothing increased 0.4 percent, that of commodities decreased 0.1 percent. The month-on-month purchaser price indices for fuel and power increased 0.5 percent, ferrous metal materials increased 0.2 percent, non-ferrous metal materials and wires decreased 1.1 percent.